On the 6th of August in 1945, at 8:16 a.m. Japanese time, an American B-29 bomber, the Enola Gay, drops the world’s first atom bomb, over the city of Hiroshima. Approximately 80,000 people are killed as a direct result of the blast, and another 35,000 are injured. At least another 60,000 would be dead by the end of the year from the effects of the fallout. The bomb exploded about 600 meters above the city and basically flattened it! It was the 70th anniversary and we went to see the site of this atrocity. Genbaku Dome-mae. Upon arrival in Hiroshima it was quite a surprise as this place is modern due to being rebuilt and it feels a lot different to other parts of Japan, It’s a very upbeat area with new flare and style. 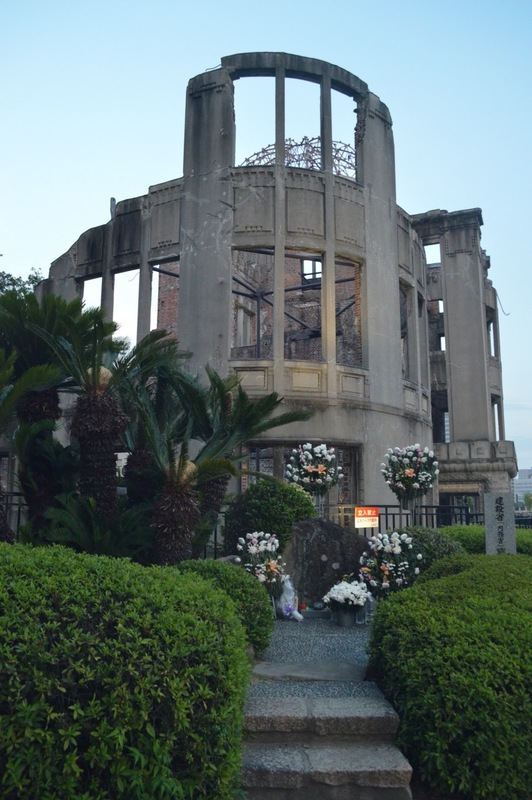 A very happening area to venture around and check out with its great restaurants, shops and of course the Genbaku Dome-mae and Memorial park. 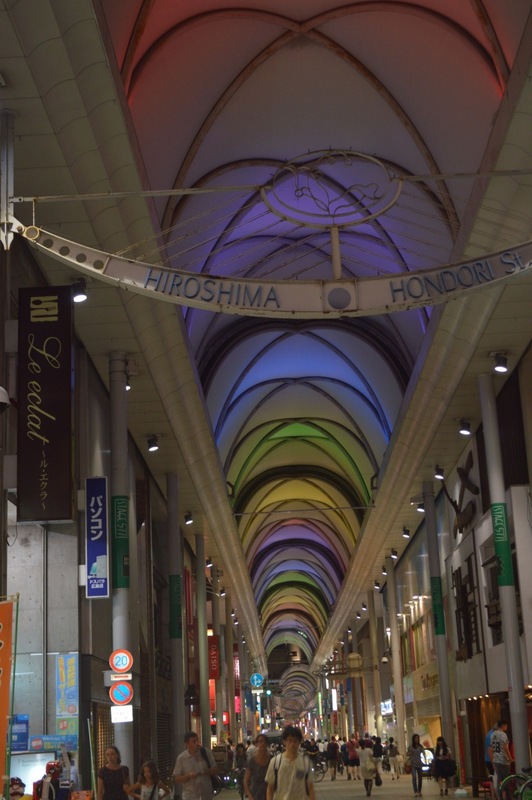 First off we went to find the Dome, walking through the shopping arcades people are smiling and having fun, shopping, drinking enjoying Okonomiyaki and other delicacies. 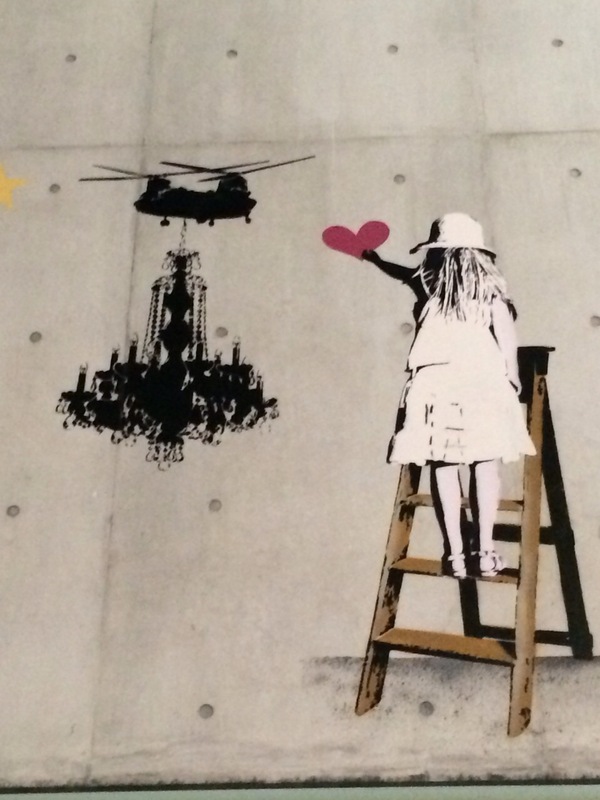 Even coming across some of Banksy’s Art. Once we got to the Motoyasu river you will come across monuments and then it strikes you! 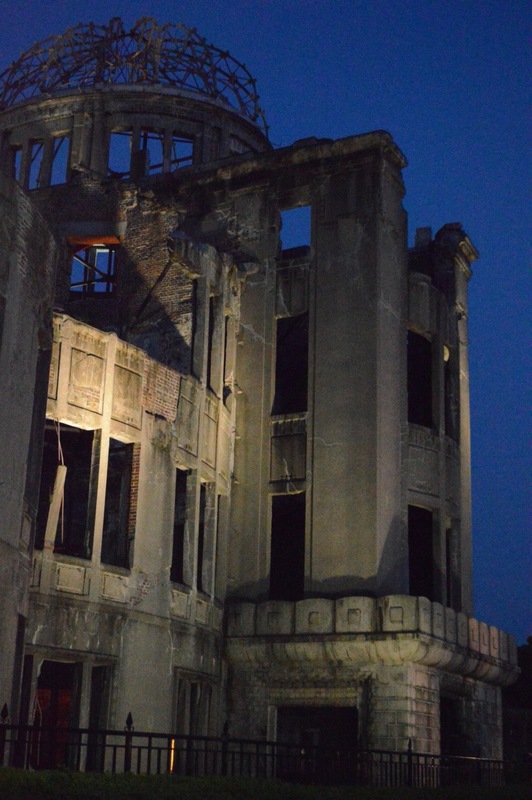 There it is the Atomic Bomb Dome, and what a strange and eerie feeling it was….. I had dreamt of coming to see this place for many years and finally got to see it. 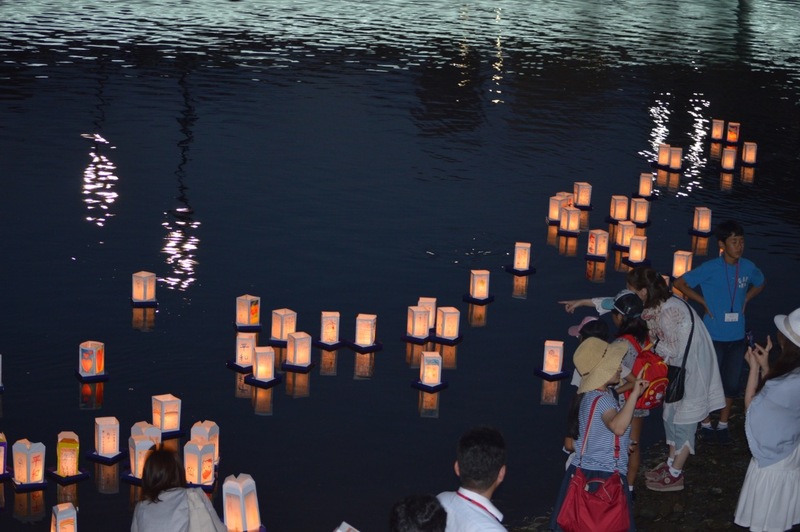 There was quite a spectacle as children were floating lanterns in the river commemorating the events. This is a must see place to remember what happened in the past and hopefully we will never see something like this happen again. 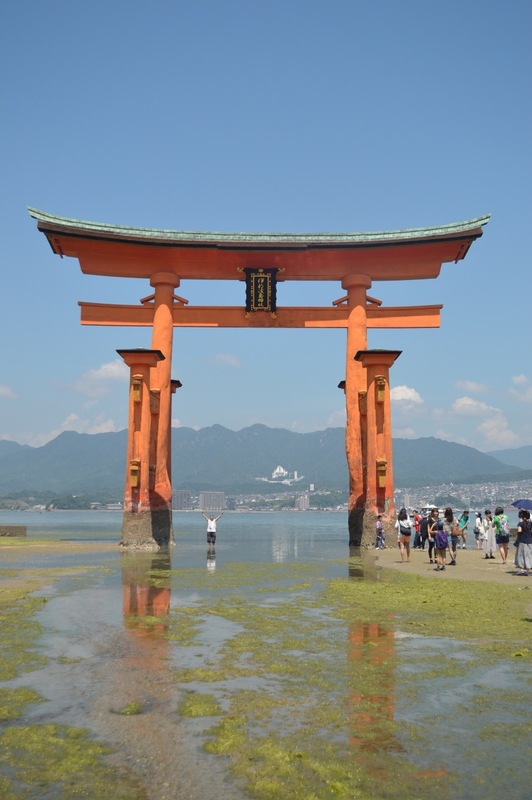 Another great place to see and experience ancient Japan is Miyajima and the island of Miyajima where the huge Torii gates of Itsukushima Shrine stand out in the ocean, when the tide is out you can walk out to it and place coins in the cracks and make a wish. It’s a 10-15 min ferry ride from the mainland with cool calm waters. 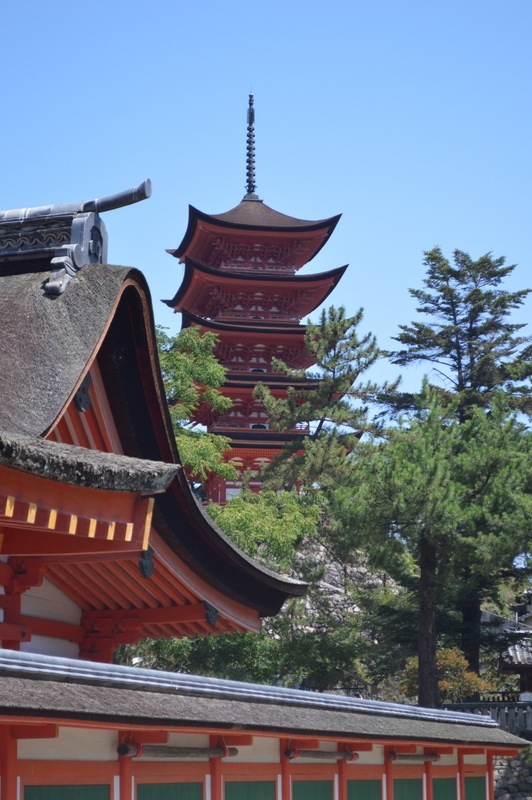 Itsukushima Shrine was first built in 593, then rebuilt by Taira-no-Kiyomori in 1168 on the same scale as it is today. A corridor of some 280 meters span more than twenty buildings. The shrine was designated a UNESCO World Heritage site in December 1996. 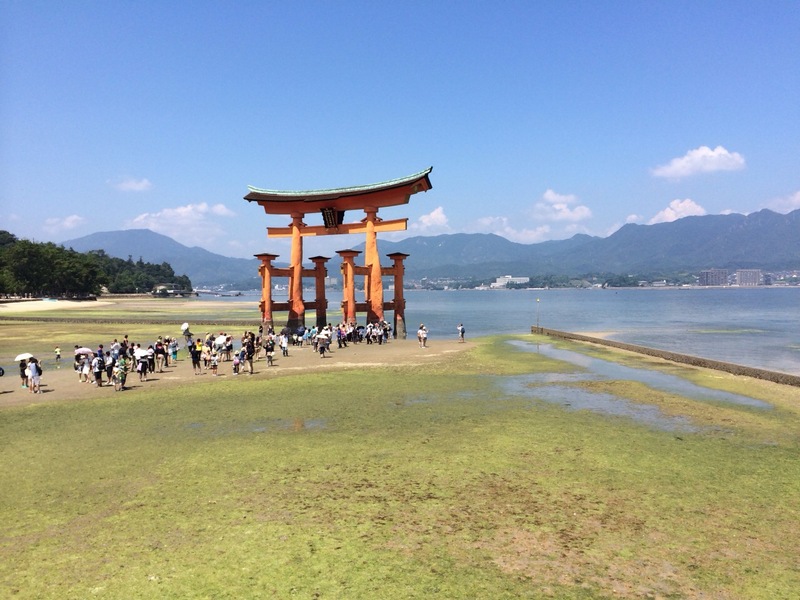 Miyajima has been worshiped as a divine island since ancient times. This is why the shrine was built in the seashore where the tide ebbs and flows. The contrast of the blue sea, green hills and the vivid vermillion-lacquered shrine is breathtakingly beautiful. A factory! A CHOCOLATE Factory! Puffed out in Otaru, Hokkaido. Having a crack in Kushiro, Hokkaido.